When it comes to Android operating system immediately comes to mind the word modding. That means, in fact, being an open source project, you can take and modify at will in order to adapt it to different uses. In recent weeks, Microsoft has "lost its keys" of the back door of Windows Secure Boot, a system that allows users to also install other operating systems on devices blocked by Secure Boot. 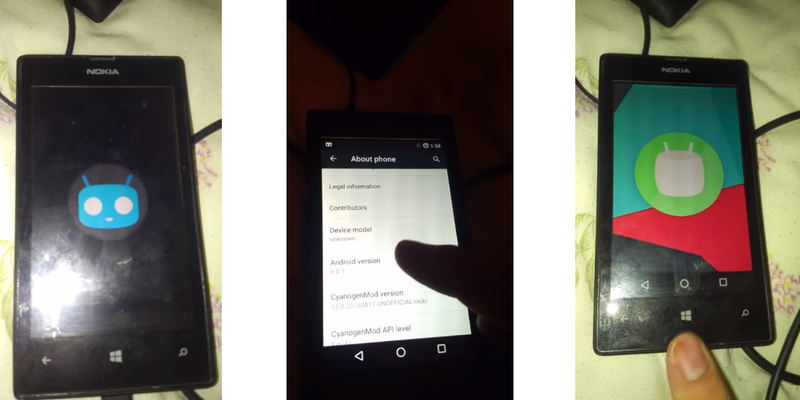 The hacker Triszka Balázs, probably taking advantage of this new vulnerability, has demonstrated the potential for installing Android Marshmallow through the ROM CyanogenMod 13 based on a Lumia 525 and potentially other compatible devices with Windows Phone. The thing, however, is not as simple as it seems. According to Balázs, there is a lot of work to do in all system drivers. Yet within a couple of weeks we will see more cases like this, because a developer preview will be released and allowed to make a dual boot between Windows Phone and Android. As you surely know, this is a smartphone that, by default, has Windows Phone 8.1 on board. However, thanks to a well thought trick, it was possible to install CyanogenMod 13. The video that we show in this link shows the first boot after installation. Later, the phone has been tested on AnTuTu to check its speed. The result was about 14,000. Moreover, as you can see in the video, there are still several problems to solve. For example, the WiFi does not work as well as the touch screen, so it needs a mass calibration. Unfortunately, the speaker and the internal modem do not work to, so you do not have connectivity at all. Initially, this test was guaranteed only in the Lumia 525, but in a new message, the developer also has made it available for the Lumia 520.